Today (February 21, 2017) is International Mother Language Day, a worldwide, annual observance to promote awareness of linguistic and cultural diversity and multilingualism. 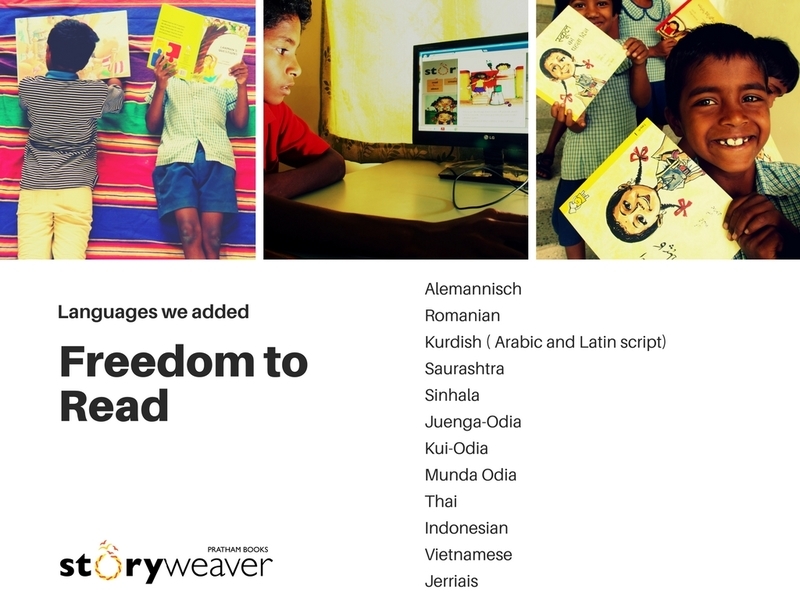 It also marks the close of ‘Freedom to Read’: StoryWeaver's campaign through which we pledged to help create stories in 15 new languages for children to read and enjoy in their mother tongue languages. As a report on mother tongue literacy from UNESCO reaffirmed “children should be taught in a language they understand, yet as much as 40% of the global population does not have access to education in a language they speak or understand”. Suzanne Singh, Chairperson Pratham Books says, “Mother tongue literacy has a very important role to play in the overall development of a child. And stories in mother tongue languages help children introduce new words and ideas into a child’s world and expand the boundaries of their minds. The ‘Freedom to Read’ campaign was our effort to make many more stories available in languages that are underserved and underrepresented in the mainstream ”. Through the Freedom to Read campaign, we have helped community users, translators and NGOs add stories in 13 new languages in the last 6 months. These languages represent the linguistic diversity of the world: from tribal languages to endangered languages to the mainstream. Not-for-profits like The Rosetta Foundation and Translators Without Borders have helped us further our campaign mission with translation support. Eminent linguists like Dr. Ganesh Devy, scholars such as Professor Sukantha Chaudhry and book champions like Sujata Noronha and Jaya Bhattacharji Rose have been instrumental in helping identify languages in need of joyful stories for children. The success of our Freedom to Read campaign wouldn't have been possible without our amazing community! Here are some of their inspiring stories. Jèrriais a Norman language spoken in Jersey, off the coast of France has been in decline over the past century. Anthony Scott Warren, one of the few Jerriais teachers left in the region discovered StoryWeaver through the All Children Reading Website, and requested that we add this ‘threatened’ language to the platform. Read more about how he and his colleagues plan to use StoryWeaver to teach the next generation Jerriais. Muhamadreza Bahadur reached out to us to add Kurdish which is categorised as ‘an endangered language’ to StoryWeaver. Muhamadreza shared that he was keen to translate children’s stories to the language for two main purposes; promoting literacy in the languages among Kurdish children, and second, to help populate and enrich the corpus of literature in the language. Kurdish is available in both the Arabic and Latin script and 21 stories have been translated. “Saurashtra is a language spoken by a group that migrated from Gujarat two centuries ago to cities like Madurai, Chennai and Tanjore. The script for this language is no longer in use and while it does follow the Devanagiri system, many native speakers cannot read Hindi. The only languages available to write Saurashtram are English and Tamil.” wrote Pavithra Solai Jowahar who asked us to add her mother language and has been busy translating stories and creating a book of rhymes in the languages. Read her story here. Rebeka Gemeinder’s mother tongue is Swiss German (Alemannisch), a language spoken in Switzerland, Austria, Germany and Liechtenstein. Unfortunately the language gets lost more and more everyday as she writes in a blog post for us. Read it here. Amelia Bonea is a historian based at the University of Oxford. Originally from Romania, she has lived and worked in Japan, Australia, Germany and the United Kingdom. When not engaged in academic research, she likes to read and translate children’s literature, most recently on StoryWeaver. Read Amelia's lovely blog post on mother languages, here. Here are just a few of the ways in which educators, not-for-profits, librarians and language lovers are using StoryWeaver in the classroom. Pragat Shikshan Sanstha works with 150 Zilla Parishad in the Phaltan district of Maharashtra where where they have set up community libraries. Volunteers from the community are appointed as coordinators for each library where they facilitate reading, conduct storytelling sessions and activities around the stories. All these libraries have one tablet and a small projector attached to it through which stories are projected. Pragat Shiksha Sanstha regularly downloads Marathi stories from StoryWeaver, puts them on pendrives which are then passed on to the 150 schools. The teachers project the stories via the tablet and the projector and conduct storytelling sessions. Over 10000 children are impacted through this project. Professor Sukantha Chaudhry, an eminent scholar and respected translator extended his supporter to our campaign. “I was so taken with the concept of StoryWeaver that I experimented in downloading and sharing some of the Bengali stories to children in rural state schools. The students were from underserved backgrounds and often first generation learners.” Professor Chaudhry visited a few in schools in South Dinajpur district and in Birbhum district. “The response is overwhelming -- the children love the stories, in the utterly novel on screen digital format (which they are often seeing for the first time in their lives) and respond articulately with great enthusiasm. Their teachers indicated that it was certainly helping them hone their reading skills and, more importantly, acquire a love of reading.” Professor Chaudhry is working on a plan to make such offline reading sessions a regular practice in schools across the state of West Bengal through active teachers' networks. As all content on StoryWeaver is openly licensed, many organisations around the world have discovered, adapted, translated and used content from the platform. Little Thinking Minds has created the first ever online reading platform to advance Arabic literacy in schools. Read how they are using StoryWeaver, by clicking here. The Asia Foundation’s Books for Asia program is selecting and adapting content from StoryWeaver’s collection of children’s books for local language e-book initiatives. Read more about their work here. A big, big, thank you to our amazing community across the world who have translated and created stories and shared them with children. See you soon on www.storyweaver.org.in! Here's to more stories in more languages for more children to enjoy! If you'd like to translate stories in your mother tongue, and can't find it on StoryWeaver write to us at storyweaver@prathambooks.org and we'll add it!